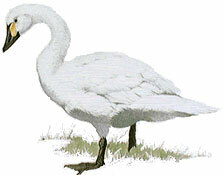 Bewick's swan and the whistling swan are sometimes treated as 2 separate species, but are so alike that they are now generally regarded as conspecific. Both breed in the far north of their range and migrate enormous distances to winter in Europe, China, Japan and the USA. Males and females look alike -- the female is sometimes slightly smaller -- and juveniles have mottled grayish plumage. The swans feed in shallow water on aquatic vegetation. The bonds between mates are strong and permanent and are formed and maintained by mutual displays. The female lays her clutch of 3 to 5 eggs in a nest of sedge and moss lined with down, usually near water. She incubates them for 35 to 40 days. The cygnets must make the long migration south when only 80 to 90 days old.